“Who's going to drink all the soda dad?" I overheard my son, Joey, asking my hubby about the sodas he just bought. We usually don’t drink soda at our house, so my son was puzzled as to why my husband bought a few 2-liter bottles. I thought that he just got it because it was on sale, but then I heard him say, "No, mom is sick and soda will help her feel better." I don't know if there is any scientific explanation to it, but thinking back on it, soda was one of the "comfort" drinks that we had growing up. Is it just a Filipino thing? Maybe, but I don't really know. I was so touched by my husband’s sweet gesture. Even if there is no scientific reason as to why you feel better after drinking orange soda, I know for a fact (and apparently so does my hubby) that it works for me. I guess that’s what having “comfort” food or drink is all about. It’s all about the feeling of being wrapped up, cuddled and cared for… especially when you are sick. It makes you feel like a child again. The sweet tangy taste of orange soda (we had Royal Tru Orange back then but Sunkist is close enough!) and the faint fizz from the carbonated drink warms your heart… You might think it is über cheesy, but hey let me savor the moment. I think my husband over did it though because a week later most of the Sunkist was still sitting in our pantry. So I used the orange soda as a cooking ingredient. And I used it to take center stage in cooking my Orange Glazed Chicken. I wanted to capture the sweetness of orange and let it stand-out by adding orange rinds and wedges. The result was a sweet orange flavored dish. Along with the Orange-Glazed Chicken, I prepared a bean sprout (togue) and cucumber salad. I got the salad recipe from my Mama. She calls it Kimchi. I always tell her, “Mom kimchi is most commonly served as spicy pickled cabbage, not bean sprouts,” but she still insists in calling it kimchi salad up to this day. LOL! Oh well, that's why I love my Mama. But let me name the salad- Bean Sprouts-Cucumber Duo. The combination of the Orange-Glazed Chicken and the Bean Sprouts-Cucumber duo is so divine… it’s like a perfect marriage. Plus, when it’s all laid out on the plate with all of the garnishing of orange wedges and toasted sesame seeds, it will definitely get an oh-so-delish remark from your loved ones… Happy cooking! Wash the chicken thoroughly (I use salt to clean my chicken). In a saucepan, combine all the ingredients and let it simmer. You want all the ingredients to blend well. Place the chicken on the pan, skin side down. Cover and cook until chicken is done. Cooking time takes about 30 minutes but if chicken is not cooked yet add water. Wait until it dehydrates. 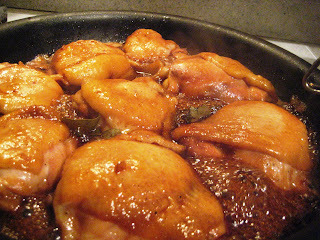 You must turn the chicken twice so that the sides won’t burn but allowing it to caramelize. The chicken at this point needs some TLC - never allow it to burn, as it will have a bitter/ burnt taste. Add orange rinds and cook for a few more minutes. When serving, garnish it with orange wedges and toasted sesame seeds. Blanch the bean sprouts. Drain and set aside. In a pan, boil the vinegar and sugar together. Stir until sugar is dissolved. Add the onions and sesame oil. Let it cool. Arrange the bean sprouts and cucumber in a serving plate. Pour in the vinegar mixture. Make sure that the vinegar is already cold. 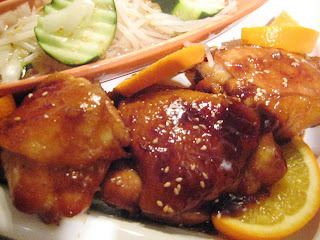 Serve the Orange Glazed Chicken alongside the Bean Sprouts–Cucumber Duo… ENJOY! I'm glad you find this entry FUN!!! and yeah orange you gald it's chicken? so stan will like this recipe.. try it! oo i put ginger at i agree my kiddies and hubby didn't even notice na may oyster sauce. I forgot to tell you that i saw sa fb mo about the green tea for cholesterol, naka green tea na kami nang hubby ko since i read that post sa fb mo. sige this weekend i will make the orange chicken. na print ko na nga yung recipe, eh. i will also share it with my co-worker kasi pati sya she watches na rin your blog site for recipes. thank you so much gabbie! You already tried the NO FUSS BBQ chicken right? Let me know how the orange chicken goes. Btw, I'm thrilled to see you again! This dish looks very delicious. I love the orange soda...can imagine the beautiful taste. I'd have a big bowl of rice to go with it. oh yes mary, gotta have rice with it.just make sure to walk it off after hahaha! hi malou! i was reading your recipe in facebook that was sent by a classmate of mine from CSA... i like your recipe and and very simple to follow!and looks good and appetizing too!... and then i find out that you're husband is christian who happens to be my batchmate from CSA!.. he's such a lucky guy!...well, if you don't mind, i'll ask my a couple of friends of mine to try this dish of yours! and i shall be looking forward to viewing/ reading more of your dishes! Thank you for your kind compliment. Yes Christian is my hubby. I met a lot of your batchmates at the reunion at Gigi Garchitorena's house last June. I met Gabbie Dualan today too, it was through this blog that we got to know each other as she follows it too. Yes, please feel free to share it to your friends. I hope it will inspire them to cook... and to discover the fun and love for cooking! Welcome and I hope to see you around!